(Adult Supervision and Assistance Required) Use a soup or tomato can. Punch two holes near the top for the coathanger bale. Cut the coathanger to size with tin snips, making a handle long enough so that the hand will not get singed when carrying the lantern. The holes punched in the sides are to let air in and light out. These can be punched in any design, as long as the holes cover all sides. 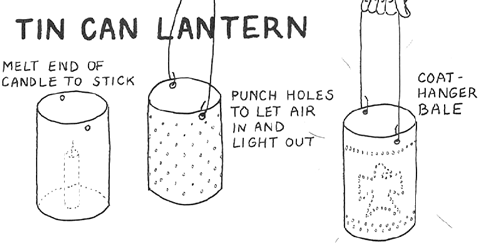 To punch holes, put the can over a log slightly smaller than the inside diameter, and punch with hammer and nail. The log anvil will prevent crushing of the can sides. Always blow out candle when the lantern is going to be unattended (for safety reasons).